Disaster Restoration Singapore (DRS) offers Air Scrubber rental services for clients who would like to control airborne particulates during construction activity or mold remediation, to either capture the particulates using HEPA Filters or flush it out of the indoor environment. This deployment has benefited many clients who wanted to prevent cross-contamination and migration of dust particles into non-construction or non-affected areas. DRS air scrubbers are so unique that they can be deployed in a number of ways depending on the site requirements. In some situations, for example during construction or chemical sanitization, it may be necessary to protect an area from contamination. This is achieved by pressurizing the area with “scrubbed” air. The “scrubbed” air will flood the area and prevent contaminated air from entering. The intake duct can also be used to clean air from an area that is too small to accommodate the DRS Air Scrubber. 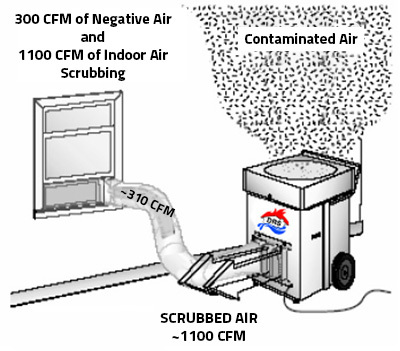 Scrubbing the air from a contaminated crawl space is an example of this application. A device that is used to remove particles, gases, or chemicals from the air within a given area. It is high efficient air filtration equipment that’s ideal for handling indoor air. A device that is used to remove particles, gases, or chemicals from the air within a given area. 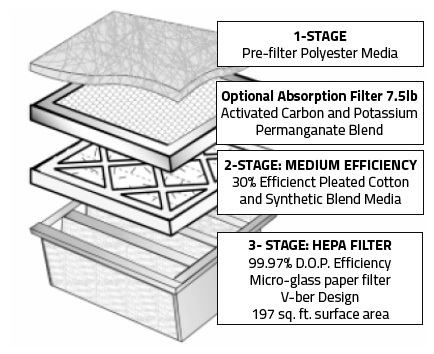 The HEPA System captures removable airborne particles. Ready to rent air scrubbers for your premises? If you need to protect certain areas of your premises from cross-contamination by airborne particles caused by construction or other remedial works, call DRS now to rent our air scrubbers. DRS’s air scrubbers have been proven time and again to keep your designated areas clear of airborne particles, dust and other contaminants. Call DRS now at 9321 9321.